These last couple of weeks have been going really well in terms of tracking and getting activity — I am on my second week of making practically nothing but Weight Watchers meals using my WW Kitchen App for the iPad. To say I love the app is an understatement!! As you can see, there is so much variety and the hubby has loved every single thing I’ve made. It’s amazing how much food you get for the points as opposed to eating the same number of points out at a restaurant! I’m still working on going out to eat less — I’m staying within my budget for dining out, but still want to reduce it even further. I love this app because it really makes everything SO easy! When you select a recipe, you can send it to your recipe box, add it as a favorite, add it to a shopping list and EVEN track it. There’s a little meal planning feature so you can designate certain meals for certain days. I told hubby the only thing the app doesn’t do is make the food for me — DARN! If you don’t have an iPad — don’t worry. 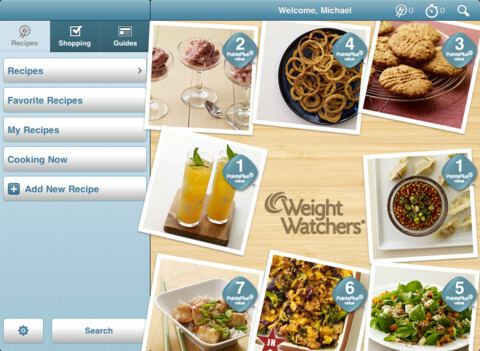 You can find all of these recipes on WeightWatchers.com — it just makes it so much easier for me to find recipes using the iPad and it’s literally a point and click to plan the menu. Aside from making the goal of eating predominantly Weight Watchers recipes, (which let’s face it, are just regular recipes with everyday healthy ingredients) my weekly goal these last couple of weeks has been to add fruit or veggies to every single meal. Whether I throw in a banana with breakfast or dice up celery and green onion to add to my chicken salad, I’m making the effort of adding fruits or veggies to everything I eat! Last week, I earned 9 Activity Points according to my Active Link — this week I am aiming for 10! I’m trying to give myself specific goals that I actually complete, rather than the broad ones of “I’ll eat more veggies or go to the gym more often” which are things I’ve said in the past. This week, I’d like to focus on more water. I’ve been getting in about 64 ounces a day, but drinking 2-3 diet sodas — and I want to get back to my one soda a day and 120 ounces of water. I think I’m craving soda so much because I’m limiting my going out to eat meals — my body must be looking for something else to latch on to since I’m eating better. On a side note, tomorrow is the Golden Globe Awards! If you like to watch the awards or red carpet arrivals, follow me on Twitter at my fashion/beauty blog @GlamorousBlog, as I will be live-tweeting the event! I love to chat with everyone on Twitter during the show to see what everyone thinks — so join me tomorrow afternoon for the E! Red Carpet. It’s amazing how in control you feel when you track what you’re eating. It’s also amazing how something as simple as writing it down can seem so impossible when you’re in a funk or you just don’t want to put in the effort. For me, the last few months have been a little bit of both. I’ve mentioned in previous posts that our living situation was really uprooted there for a few months — me having to go from making food for the hubby and tracking everything to making stuff just for myself. It’s a sad fact, but I don’t put the effort into anything if it’s just me. I got off track with writing down what I ate and pretty soon I was tracking once or twice a week. My weight crept up about five pounds and the 2.5 months since moving has been a fight between gaining and losing the same 3 pounds. Well, I don’t know how it happened, but I got pissed off. Pissed off that I was STILL in the same boat I’ve been in for the 2, almost 3, years on Weight Watchers. Sure, I’m 25 pounds less. But really?! In 34 months I lost a whopping 25 pounds. What a waste of time and money. The rut/cloud/funk I’d been in finally drifted away about a week ago. Then I found numerous challenges to join — which I mentioned in the post Hello, 2013! and I finally started to do the fundamental things Weight Watchers teaches members. I tracked every single day — I had a major disaster with a plate of brownies over the course of 4 days, which brought my weeklies to an embarrassing -53 PPV. But you know what? They were tracked and accounted for — that’s more than I’ve done in weeks. Finally, I’ve been feeling better. More in control. I’ve gone to the gym three times this week and earned a few points with my Active Link. It hasn’t been much, but I’m just trying to get into the mindset where I need to go and workout. I’ve been trying to get in at least 64 ounces of water — some days it’s more. The great news is I’m down 1.4 pounds this week, even though I was -53 weeklies. This week should be much better, as I won’t be making any desserts to be tempted with for the time being. I’m turning 30 in a few weeks, and I’m determined to get this fat suit off by the summer. I literally spent my entire 20s unhappy, overweight and depressed about how I looked — I’ll never get that time back. I’m certainly not going to let another decade slip out of my fingers.